GREETINGS FROM the user friendly universe of ...Gilgamesh Missouri-Home to Toasted Ravioli , Where'd you go to high school?" ST LOUIS---. Smash Mouth all-in-preflop poker is somewhat of a river game. Small Ball Holdem, on the other hand, is somewhat of a flop game, so if you can see three cards cheaply, it is a good thing. Smashmouth poker is about first in money- ----You can't immediately win by calling; you can by betting, or raising! Betting or raising allows the possibility of winning the pot immediately by forcing decisions on the other opponents, who may very well fold, with slim holdings. Small Ball Poker is about calling one or two small bets, but more than that it is about Never getting all your money in pre-flop. The best way to win in small ball is to fold more! (after you see the flop). Smash Mouth players are looking for reasons to bet, Small Ball, reasons to fold. Therefore, folding, is the "invisable" way to win. Try telling that to a Friday night action player: "Let's go to the casino and fold 60% of our hands!" Most of the bad beat smashmouth pedal-to-the metal stories you hear start out like this, "Well, I got my money in good... only to get sucked out on the river." On the one hand, smash mouth poker is about agression, and poker rewards agression (selective aggression). On the other hand, Infinite patience in poker is also rewarded immediately. (You can't lose money you don't put into a pot). As Mickey Mantle said in his 1985 autobiography"When you keep aiming for the fences, you're bound to strike out a lot ." Small ball poker avoids the MIS (move in specialists) and let them have their hands. With Small Ball poker, AFTER the flop, you can evaluate the texture and the number of players in, and attack. If the pot starts to get big, then you must be ahead to continue to play. If you can keep the pot small, you can read you opponent(s) and decide what is in your best interest. 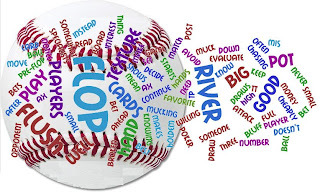 You have to be a good post flop player to play small ball. You have to be willing to see a flop with TT, knowing full well that it might mean mucking the hand if the texture of the flop doesn’t match up with your cards (No Set, No Bet). You need to make high value river bets when the board shows broken draws. You can also bluff someone who is chasing you down with AX when the flush card comes on the river. 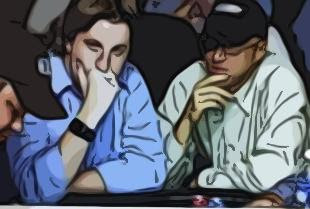 Ax players know the flush draw very well as its their favorite hand. They WILL notice and often muck TP (top pair) to a big river bet that makes a 3 flush.